This attractive perennial shrub has abundant small flowers in late February or early March. The flowers are a red-yellow color. 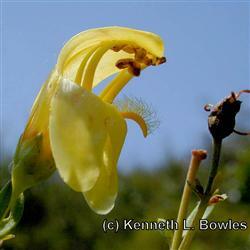 The flowers attract hummingbirds and they will be seen flitting about during bloom season. It prefers good drainage and little summer water.